The Vamps announce Four Corners UK tour! The Vamps are certainly having a busy Summer! Fresh from a US promo tour where they performed on some of the biggest TV shows in America, they now return to the UK with the announcement of their Four Corners UK & Ireland 2019. On top of this, they then release their highly anticipated new album Night & Day (Day Edition) next Friday 13th July. 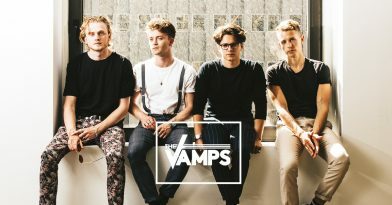 The Vamps kick off their Four Corners UK & Ireland 2019 Tour on Saturday 27th April at Plymouth’s Pavilions, and then spend the next 5 weeks visiting all corners of the UK before wrapping the dates in Bournemouth on 1st June. Tickets go on sale Saturday 28th July at 10am – for more information and to buy tickets, please visitwww.thevamps.net/tour. The Vamps will be joined on the tour by pop-rock trio New Hope Club (all dates) and rising star HRVY (*selected dates).